It’s easy to learn to use a mouse. But touching you don’t need to learn at all. It is so intuitive that even an 1-year old child can interact with touch devices in meaningful ways. And if an 1-year old can use touch devices, so can you mother and grandmother too. And even your company CEO and board members can. It is not just the physical difference in interaction. All touch devices are categorically also designed with a mindset that they should be easy. With a few rules of thumb most designers really do seem to achieve good usability on touch devices. Modern on-screen-keyboards are enough for most people’s casual use, and alternative input methods like voice recognition and eye tracking decrease the need for keyboards. However, for those who do a lot of typing, optional keyboards are available. 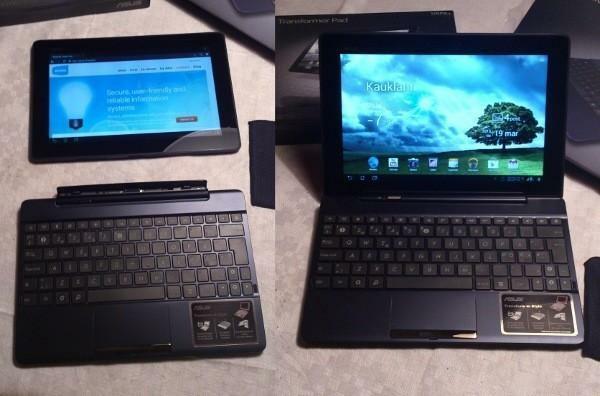 For example the Asus Transformers have as an accessory laptop style keyboards, with the additional benefit of also including an extra battery that doubles the use time of the tablet and extra slots that increase the total amount of USB inputs and SD card slots of the tablet. The basic design – a plate with a screen on the other side – is simple an elegant. The thickness of tablets equals to the thickness of an magazine and the dimensions of a 10-inch screen are quite close to the size of an A4 standard paper. Most people find this very pleasant. Maybe it is the because of the golden ratio. Most women can fit a tablet in their purse, and that is 50% of the potential user base. A 7-inch tablet will fit in the jacket pocket of a man’s suit. Personal covers and sleeves for tablets are much more common than for laptops. Tablets don’t have sockets for Ethernet cables at all. You must have an wireless connection to the Internet. All tablets have wifi, and mobile broadband is common. If you have a SIM-card inserted, you can even use your tablet as a mobile phone, making calls and writing text messages. With a tablet you’ll be as free as what mobile phone users are accustomed to be. Tablets are designed to unleash their users quite literally. The only cord that is needed is for power and even that infrequently enough, that you really have confidence to leave your house without a charger. If you go with you laptop somewhere, you always take your charger with you anyway, right? A few rare laptops have 9-cell batteries and 10+ hour battery life, but average laptops have a 4-6 hour battery life, whereas for tablets 10 hours is the norm. Some tablets, like the Asus Transformer models, have an external keyboard that hosts an extra battery that will almost double the total battery life of the tablet. Some years ago Nokia did a study on what their users like most about them. The outcome was that the most liked feature in Nokia’s phones is long battery life. Laptop manufacturers seem to neglect the fact that no matter how fast and cool you laptop is, if the battery runs out, the whole machine is dead. Although Linux users have been blessed with software package management and virus free computing for a long time, most people have a Windows background and to these people the new tablet environment is a significant improvement in terms of security and management. Various app stores provide software installation and automatic upgrades. There is little local storage, so all data use is built around cloud storage and thus backups of user data is done automatically. There are no viruses and the mobile operating systems are so well locked down and sandboxed, that malware makers basically concentrate on tricking users into installing the malware themselves, as viral spreading is next to impossible. And if the tablet is in corporate use, the company administrator can choose to lock the devices even further without much thought, as the tools to it are built-in. With tablets people are inclined to learn a new way of computing and ready to give up old Windows habits in favor of learning to use alternative operating systems. Luckily for us, of all tablets, the Linux-based ones are the most common both when counted in number of models available and since recently also in device volumes. And for old Linux users who prefer something else than the Android flavour, there are options to run their familiar programs in chroot, dual boot or to completely install some other Linux flavor on the Linux-compatible device (although the latter options might require a lot of expertise). At least for the US, retailers report that in 2012 the sales of tablets surpassed the sales of notebooks, and the same is likely to happen for Europe in 2013.